A rather late Greek Revival in the West End. 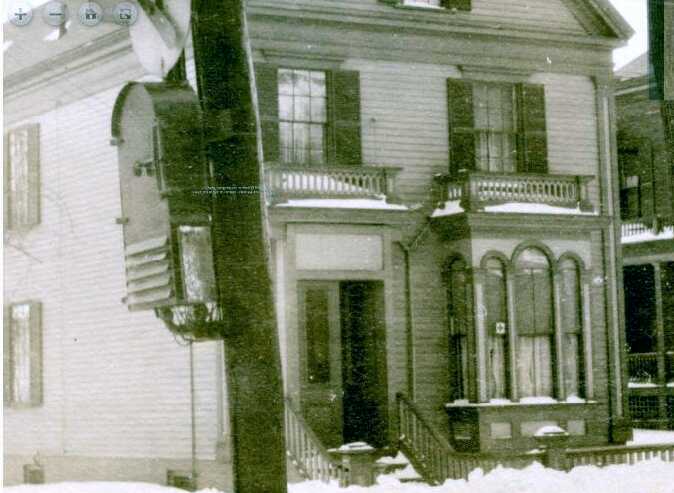 Stephen Dyer was a ship carpenter working on Commercial Street and living on York Street when he purchased a lot from James Merrill in 1860. I’m not sure that he actually lived in the house as he sold it in 1861. The house is a fairly common Greek Revival form with the gable to the street and entrance on one side. There is a very proper architrave supported on solid pilasters and a closed pediment above. All very proper and well executed. All a bit late for the style. By the early 1850’s the Italianate and other ‘romantic’ styles had begun to supplant the Greek. In fact, Thomas Egan built a house in the new style across the street four years before Dyer built our subject. The bay is the one thing on the house that is ‘modern’. 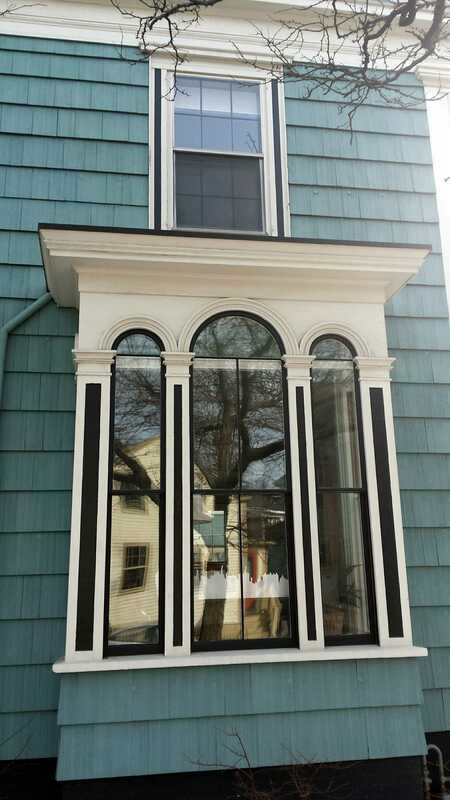 Showing arched topped windows and well modeled capitals on the window stiles, it is very italianate. It also seems to mirror the windows on the bay of the Egan house. It doesn’t seem likely that the two share the same designer as I do not know of Thomas Cummings working in the Greek style. The entrance is very plain with the brackets being the only sign of decoration. 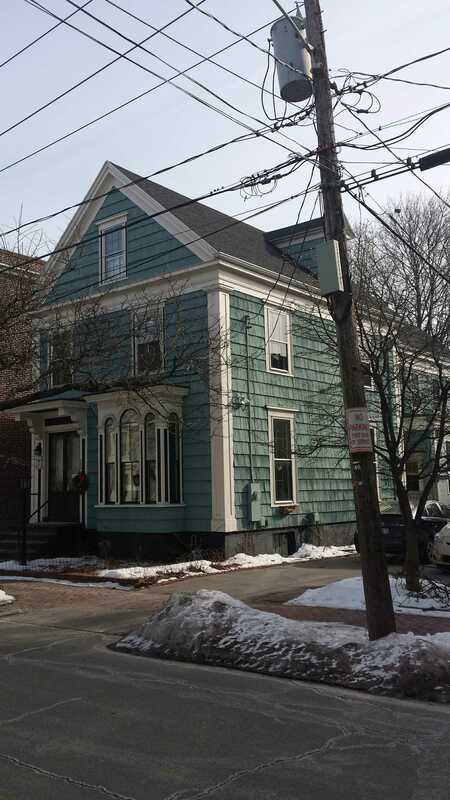 The siding, cedar shingles painted a pleasant blue/green, is incorrect for the style. The correct choice would be matched boards painted a light, not white, color to imitate stone. Barring this, clapboards which would somewhat mimic laid stone, would be appropriate. The shingles are far too busy and create too many shadow lines. The 1924 tax photo shows the house with claps. It also seems to show a different treatment of the entry along with balustrades over the bay and entrance. The house is in very good condition and is listed as a single family home. 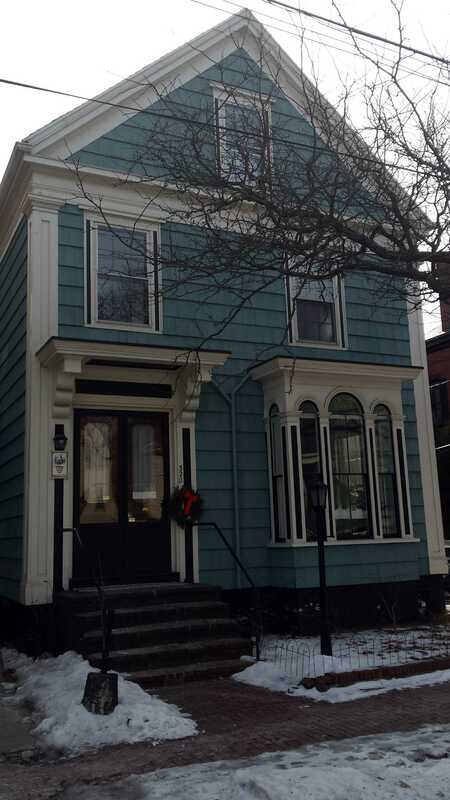 This entry was posted in Architecture, Greater Portland Landmarks, Greek Revival, History, Images, Spring Street, West End Walks and tagged Architecture, Glimpses, Greek Revival, History, images, Italianate, Maine, Portland, West End on May 10, 2017 by alewifecove.